Peabody and Emerson are hoping for a quiet dig season, but with their son Ramses along for the ride, nothing is going to be quiet.. ever! 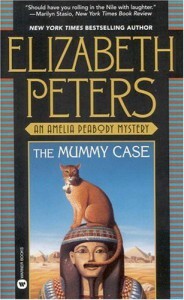 As soon as they get to Cairo, they are embroiled in a new mystery and Amelia is sure that there is a master criminal afoot. After two murders and some mysterious disappearances of antiquities, even Emerson has to agree that something is going on. I LOVE these books. Embroiled with history and a little mystery, these books will keep you chuckling as you go through the pages.